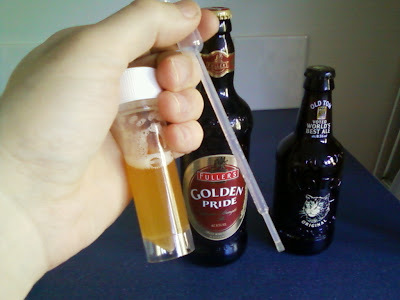 I've repeated my Brettanomyces experiment with Golden Pride and I actually had a bit of scientific rigour this time. I measured the gravity and pH of the test sample and a control, as well as carrying out a triangle test. My able assistant Will was able to spot the odd one out in the triangle test without any difficulty, though on reflection maybe I should have gone for two out of five just to make it a bit more statistically significant. The gravity of the control was 1.019 and the test sample only one degree lower at 1.018. I suppose that as in the previous experiment the bottle hadn't been a terrible gusher I shouldn't have been surprised that not much further fermentation had taken place, but considering how drier the test sample tasted I still was. The pH caused further surprise for me being the same for both sample as the fairly high pH of 4.22 meaning low levels of acidity. The only other figures I have from a beer with Brettanomyces as a bottling yeast are from Ron's blog. Translating the acidity percentage for Colne Spring Ale using my handy ready reckoner we get figures ranging from 4.08 to 3.88. Not as high as the Golden Pride but still low to average levels of acidity. I suspect the sour character of old aged beers came more from bacteria than from Brett. I've got a new yeast book recently, which actually includes three whole pages on brewing with Brett so I'll report back soon it I can shed more light on my findings. As a devoted member of the one true catholic and apostolic beer consumers organisation I was delighted to see that part of a speech by His Holiness the CAMRA chairman has been put online. It's a shame the sound's so poor and we only get a selected excerpt, but surely no discerning drinker could fail to agree with the sentiment? It can't be denied that the blogosphere is riddled with neo-kegist heretics. Those that drink in the way's of righteousness will have been as horrified as me to see many bloggers extolling the 'virtues' of keg beer recently. And as Rob points out CAMRA come in for a lot of stick online, even to the extent that brewers and bar managers will insult their customers if they're CAMRA members. It's about time the faithful fought back and I'm glad to see the chairman leading the way. 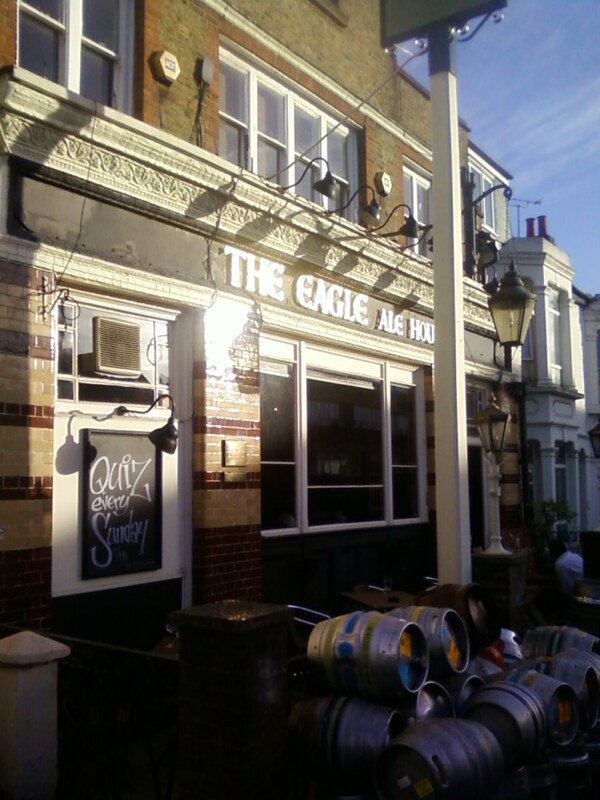 I called in at the Eagle Ale House yesterday to drop off some beers for their bank holiday beer festival. Sadly I won't be going as we're off to the lakes, but if you're around it's well worth a visit. One of the beers I picked up on Saturday was Sharp's Monsieur Rock. This beer was brewed back in October when Sharp's were still a craft brewery. Since then they've been taken over by the Molson Coors industrial mega brewery. 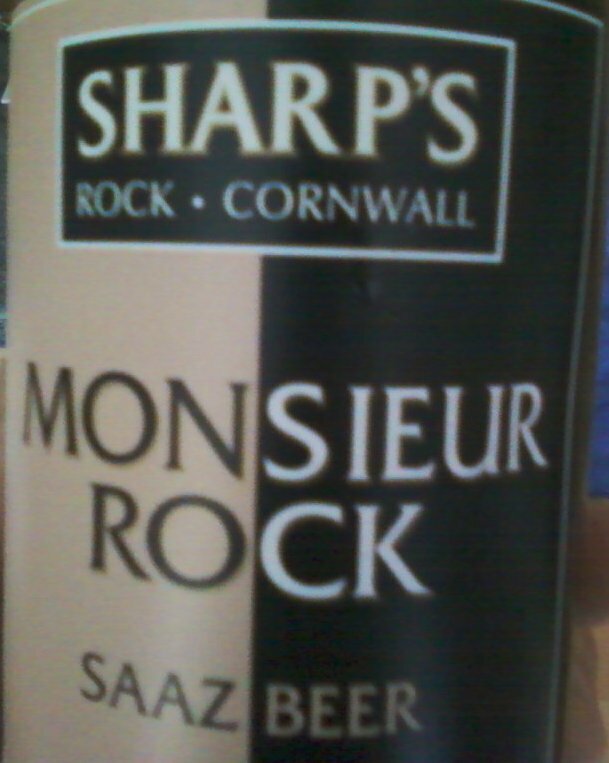 As Sharp's stopped being a craft brewery the moment the money changed hand I wondered what effect it had on the beer? Like Schrödinger's cat it seem to be in a superposition of states: both craft beer and industrial beer. I was able to observe the beer in the bottle all I wanted but this did nothing to collapse the wave function. So I opened it. Instantly the beer became one state, but which one? It was very pale, with a delicate hop aroma and an interesting flavour. The pale colour and the saaz hops were saying premium lager but there wasn't any of that unpleasant vegetable taste so it was quite like a golden ale too. I'd happily drink it again, but I'm not sure I'd buy it again, so I wasn't sure whether this meant it was craft or industrial. Then I remembered that it was an interesting beer, and as this seems to be one of the most important characteristics of a craft beer it could only be in that state. Awesome. I was back in Fulham yesterday and managed to fit in a long overdue trip to the Drink shop. A bloke from Otley brewery was doing a tasting by the entrance so we paused briefly to sample his wares. The lovely Lisa was taken with the O-garden so a bottle of that was added to the shopping list. 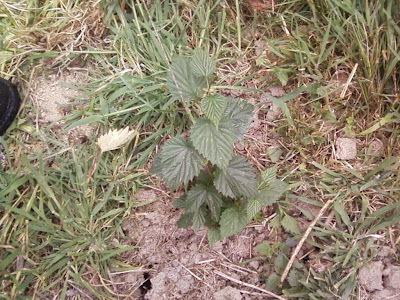 The hops looked like they could do with a bit of feeding up so I've given them some worm juice from our can-o-worms. I'm sure they'll soon be shooting up the string. Having read about the Great Baltic Adventure I got in touch with the bloke behind it to see about the possibility of supplying a beer. Sadly it was not to be as, not unreasonably, he was after some money towards his costs and the boss wasn't keen as we didn't have any. 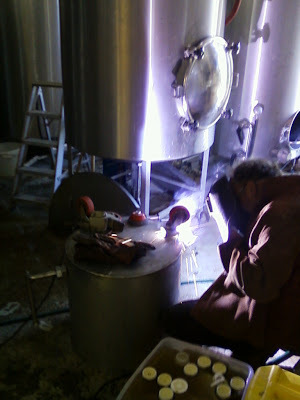 But on the plus side I was emailed some instructions for how Courage Imperial Russian Stout was made. It's fascinating stuff looking at an old brewing record, quarters of malt and lbs of alpha, black malt added to the copper and best of all, handwritten on the last page "when primary ferm ends add Brettanomyces". When I read about Colne Spring Ale I was more excited than you would believe to see that a British brewer had used Brettanomyces up until 1970. Now seeing that a beer I had actually drunk in the 90s had had Brett in it I was overjoyed. This means that I am part of a continuous tradition of drinking British beers made with Brett. As I had a culture of Brettanomyces claussenii to hand I had to give making it a go on the nano-brewery pilot plant at work. I followed the instructions as best I could, even adding malt to the copper, and giving the Brett a good while to do its work. I was very pleased with the result so I'm going to make this one again, on the main brewing kit this time. If you thought my account of the trade day at BRI was dull you ain't seen nothing yet. One of the lecturers happened to mention that acetic acid is normally found in beer at a level of 130mg/l. This lead to some hasty calculations shifting decimal places on my part, and as soon as I got home a consultation of my acidity to pH ready reckoner. This fits in well with my previous calculations and gives further confirmation I've got my figures right. 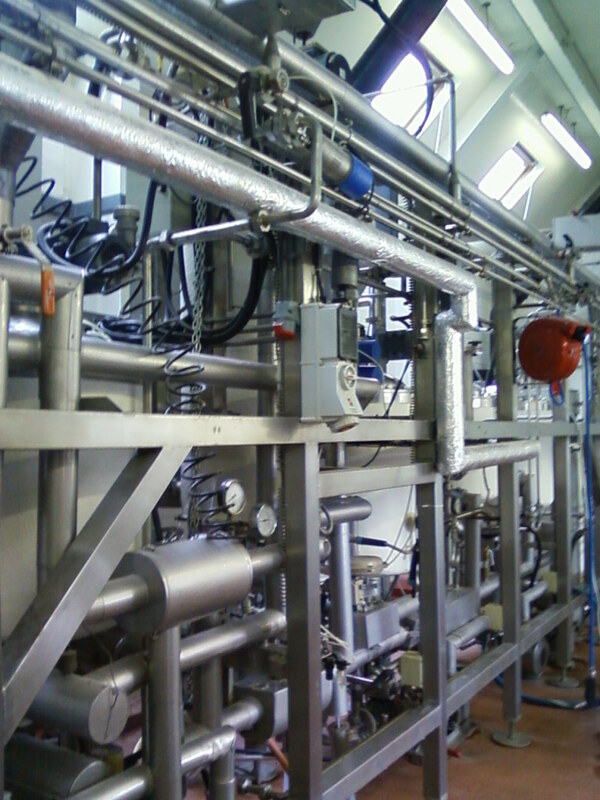 I was back at Brewing Research International on Thursday for another technical trade day. A lot of the focus was on flavour, which included very interesting practical sessions, and much to my surprise my nose was on top form. It seems I know my diacetyl from my DMS, and my isoamyl acetate for that matter. Now those who know what I'm talking about may think it's a bit bleedin' obvious but it's alway nice to get it right when you're put on the spot. Other highlights included another fascinating fact about beer acidity and learning that our bottle labels aren't legally compliant. 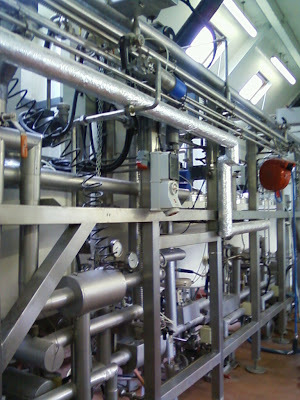 Bonus points for guessing the brew length of the pilot plant in the photo. During my continuing research into brewing with Brettanomyces I found a very interesting paper from 1904. No prizes for guessing the person that put it online. "If we add to pasteurised beer a slight portion of a Brettanomyces culture in wort (say a few drops to a bottle of the beer), and if we then leave the beer to stand in well-corked bottles at a temperature of 75 -80 degrees F during 10 -14 days, a slight deposit will be observable and at the same time the beer will assume an unmistakable English character, both in regard to its content of carbonic acid gas and to its taste and flavour"
Now are you thinking what I'm thinking? Because to me it looks very much like he's applying Koch's postulates to beer. Koch's Postulates are a wonderful bit of science, and as Claussen said in this case very easy to apply. 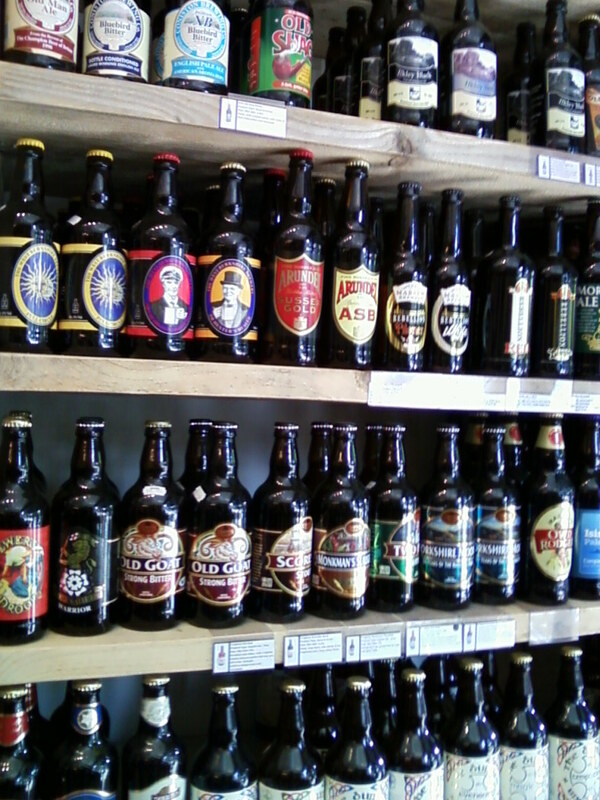 So I found some bottles of strong pasteurised beers. The first beer I chose was Fuller's Golden Pride as I've drunk a fair bit of it in my time. Back in the days when Safeways was around for some reason it was cheaper than London Pride so how could I resist? In fact it was entrapment if you ask me. I also got some Robinson's Old Tom as I've heard it's to a very old recipe so might well have had the benefit of Brettanomyces back in the day. Next I took a liquid culture of Brettanomyces claussenii and inoculated 1 ml of it into the bottles. I'd popped the tops off and let them stand for a few hour to de-gas a bit first as I didn't want them to be over carbonated. Once inoculated I re-capped them and put them in the airing cupboard for a fortnight. When I came to open the bottles it was with some trepidation. Would I have terrible gushers? Or would I have a damp squib with no noticeable difference? As it happens the carbonation level was fine and there was a detectable difference in the taste. This is no time for sound bites but I felt the hand of history upon my tongue. The Golden Pride had dried out and lost a lot of the excessive sweetness. There was a slight unusual taste (or should that be unmistakable English character?) that must have come from the yeast. None of that horse blanket malarkey mind, but definitely something a bit different, and the beer was dangerously drinkable. The difference was less apparent in the Old Tom, but again it was drier and with that slight unusual taste. If I was half the scientist Robert Koch was I'd have had a control sample, and taken some measurement such as pH and gravity, as well as writing proper tasting notes. So I'm trying to remedy my short comings by repeating the experiment with more rigour. Further results to follow. This week I had not one but two wheels fall off my bleedin' underback. As we use it as a cleaning tank as well this was a right pain in the arse. Fortunately my capable assistant Will's uncle George was back from his secret mission to Pakistan so could come round and weld the the wheels back on. The lovely Lisa spotted that one of her favourite beers, Cumbrian Legendary Ales Grasmoor, was going to be on at the Rake so a research trip was in order. We sat outside where a range of beers were on stillage. The Grasmoor was a bit flat, but the Loweswater Gold worked a treat quenching my thirst. 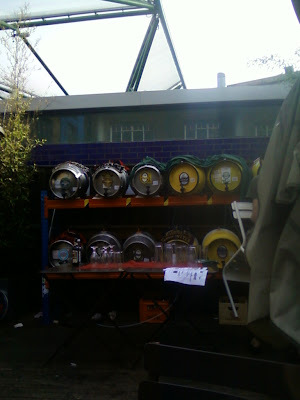 We were a bit stumped for what to try next as the beers tended towards the strong side. There was only one thing for it - we switched to drinking halves. We were disappointed that Thurstein pilsner wasn't on, as it's practically named after Lisa. So American Invasion (5% ABV) and Hawkshead Citrillo (5% ABV) were next for us, both of which were at the beer that tastes like grapefruit juice end of things. More hoppy ones were up next, a couple from Stringers: Victoria IPA (5.5%) and Hop Priest (6.5%). We preferred the Victoria as the taste was a bit crisper. After that we abandoned any attempts at pacing ourselves and I had a Mutiny double stout (9.3%) and Lisa had Infra Red (6.2%). The syrupy delights of the stout did it for me and the lovely Lisa enjoyed the way Infra Red gets better with each sip. We're a bit undecided on the Rake. There was a good beer range if you like stronger beers but I prefer to sit somewhere relaxing where I can settle in for an evening drinking beers of more modest strength. It was time for some food after that so we went to the Southwark tavern for a unique food experience. Well, I hope it was unique as the food was dire so I don't want to do it again. I got down to Brighton yesterday. 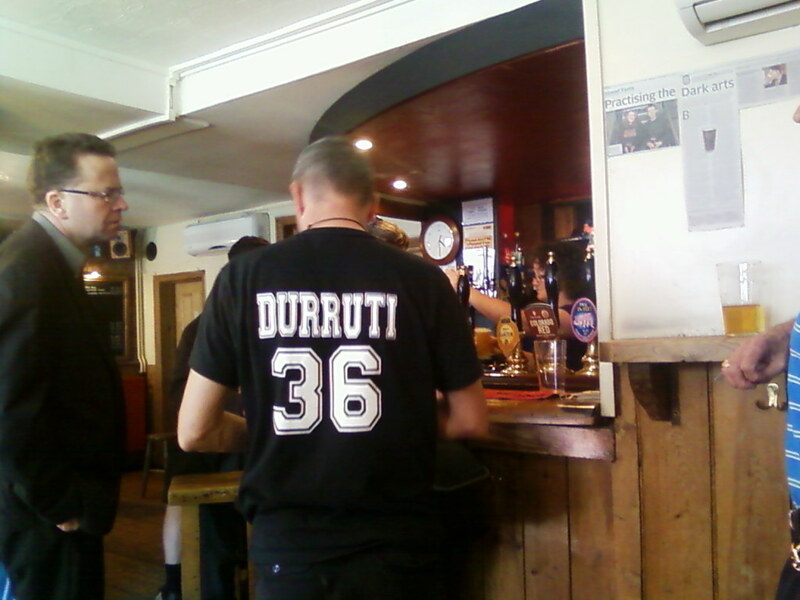 It was a lovely sunny day, but the highlight was getting out of the sun and into a pub. I've long been a fan of the Dark Star brewery so a trip to the Evening Star was long overdue. As well as Dark Star beers on draught there were guest cask beers and a wide range of bottled beers for those foolish enough to drink them. I stuck to the hand pumps of course, supping American Pale Ale (4.7% ABV), Crouch Vale Brewers Gold (4% ABV) and Thornbridge/Odell Colorado Red at the dangerously strong 5.9% ABV. I should have stuck to the weaker stuff though as I liked the Brewers Gold best. It's a great pub and very handy for the station so further beer research in Brighton is definitely called for.